Back when Guildpact was new, Teysa was one of my favorite cards in the set. I’ll be honest and admit it was largely because of her look and visual style. Commander wasn’t really a thing back then, and we didn’t yet have the concept of the 100-card combo deck where you’re guaranteed to start with one piece in your hand as long as it was eligible to be a commander. But there were still an awful lot of combos that she was a part of – Darkest Hour was a good one in larger formats. I, however, mostly played her in Standard at FNM, and I didn’t quite realize that one reason she was popular in the more midrange-speed Orzhov aggro decks was just because she could carry Umezawa’s Jitte and her tokens could carry it even more effectively. I had only just graduated from college and didn’t feel I had $25 to spend on a single Jitte, but also nobody ever discussed what the Jitte was actually for. It seemed like one of those things where people assumed that if you knew, you knew, and if you didn’t, you didn’t need to. (If you’ve never played with it, it’s actually repeatable colorless removal that bypasses regeneration and can also boost creatures in combat and win when it has to. Yes, for two mana.) I do hold that against some people, because I think they were just trying to get free wins at FNM, but the real thing I regret from that era was that I didn’t quite figure out where those $25 payments needed to go. Shocklands were hovering around $20 each, and Revised Tropical Islands were around $60. But that has little bearing on Teysa and how impressive she can be, and how we really should talk about her and Guildpact a little more often considering that she gets better every time they make a creature with a death trigger, or a sweeper that kills a bunch of your creatures at once, or a black card that counts things in your graveyard, or a white card that generates a bunch of tokens. Some things change with time, but that is not going to, not any time soon. 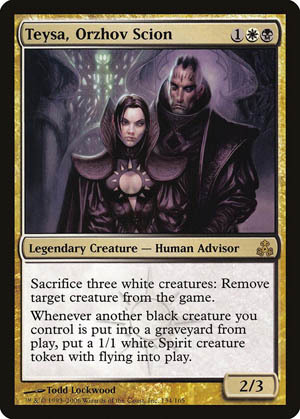 While Teysa may not have Orzhov’s keyword mechanic from Guildpact, the notoriously clunky haunt, she might be the best exemplar of Orzhova wanting to exact incremental advantage by any means necessary. As a source of repeatable exile, a sacrifice outlet (if you have white creatures), and an enabler for a “go wide” strategy, Teysa can do a lot of particularly mean things if left unchecked. Being only a 2/3 with no combat abilities or protection sort of mitigates how lethal she can be, but only being a three-drop helps a bit with keeping tempo. She’s been a casual favorite for years, but she doesn’t do things quickly enough for formats with larger card pools.